I’m fascinated by the morning shadows and light as the sun rises and moves across the sky. this is the most adorable shadow i have ever seen! i love this picture! bunny/shadow goodness. oooh your morning photos are making me miss sunshine! Vancouver is so grey these days. Oh gosh Karyn! I have some bunnies you would really adore. A year or so ago, Tyler bought me a floppy eared doodle, we call her Mirabelle. 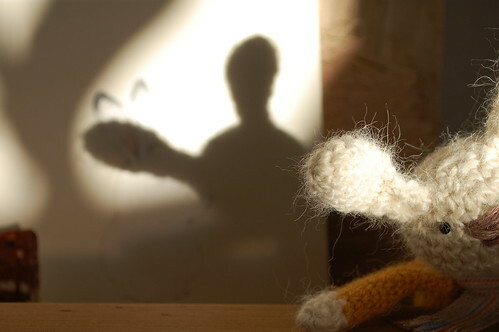 Then a friend made me a bunny similar to the one here in your beautiful photograph- thinking I collected rabbits. Isn’t that often how collections start? I think we have a similar owl fetish also. I’ll send you a photo of some incredible book ends I recently received as a gift. What fun!